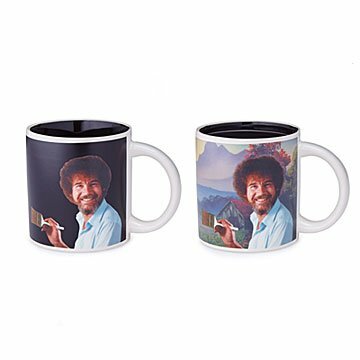 Make every morning a masterpiece with this Bob Ross mug. Calling all '90s kids—or anyone who likes to start their day with a genuine smile: this truly transformative Bob Ross mug is for you. When the mug is cold, it shows everyone's favorite curly-haired painter, smiling big against a black background. But then, fill up the cup with 12 ounces of your favorite warm beverage and like magic, a Ross-ian masterpiece comes into view. We dare you not to have a good day with a start like that. Made in China. Yes, I would buy this product again! & most likely will! Will be buying another one for my sister! Fun but image is easily damaged. This was a very neat idea, and we al loved watching the paining appear. Unfortunately, Bob's face is peeling away, even with gentle hand washing, and my son has stopped using it. It arrived early, and was AMAZING. Perfect gift for a friend. Love Bob Ross in the Morning! I use this mug almost every morning. It makes me smile when I remember how much fun my family used to have watching Bob Ross when I was a kid. And now my son really likes watching the mug change from black to scenic. I bought one for my brother for Christmas, and then one for myself. Love it! The mug is too delicate. The first one I ordered arrived with a white area in Bob Ross's hair (made it look like he had dandruff). I assumed it was an imperfection in the image, but it turned out to be a chip that kept getting bigger. I contacted customer service and they sent me another mug. The second mug didn't last past ONE HAND wash before a piece of the image started coming off. I give up. At this point I will be asking for a full refund. It's such a shame as this is such a cute mug! Bob Ross lovers will be amazed with this gift. The painting as the mug gets hot is a real treat and Bob would have been proud. It is the perfect distraction to a hectic day! This product is amazing from the quality right down to detail! My daughter likes to drink tea from her new mug. But the picture has begun to peel off and she just opened it Christmas Day. Too bad it was cute.